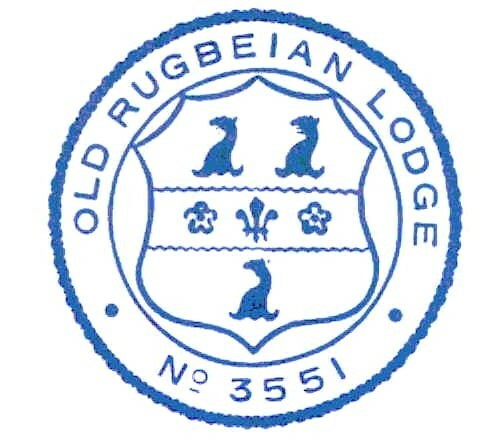 The Ol d Rugbeian Lodge was founded in 1911 and has continued to meet regularly since then. The lodge continues to thrive with five new members joining in 2018 and a similar number anticipated this year. The lodge is also a member of Metropolitan Grand Lodge , which includes many lodges across central London. The lodge takes great pleasure in contributing to fund-raising for causes across London, the rest of the country and overseas. We are particularly proud to be associated with the fund raising for the London air ambulance http://www.bbc.co.uk/news/uk-england-london-31752796?fb_ref=Default . The lodge is a part of the Public Schools Lodges’ Council, a circuit of London-based lodges, which includes the lodges of many major public schools amongst its 33 fellow members. 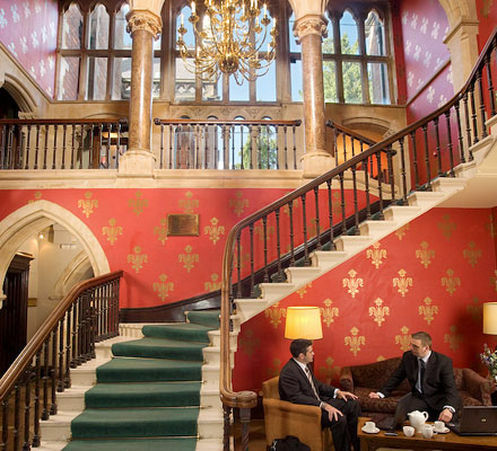 The lodges are closely associated and enjoy a substantial amount of visiting within the membership. 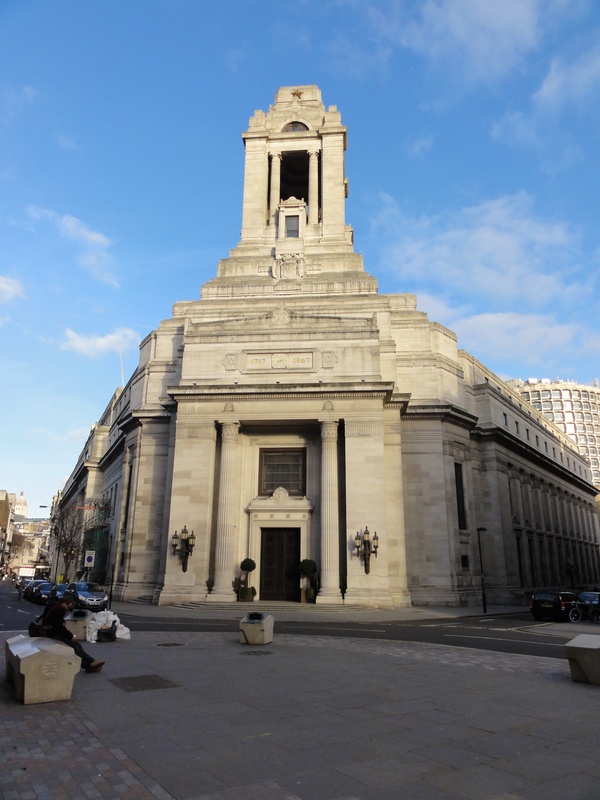 The Lodge meets in London four times a year, usually at Freemasons’ Hall the home of the United Grand Lodge of England. The lodge dines well afterwards at a number of excellent venues. The dates of meetings are the fourth Monday in March, April, October and November. It also usually meets once a year at Rugby in the Trinity term. A little about the Old Rugbeian Lodge in the 2018 E-Floreat. The lodge enjoyed receiving a number of guests for an excellent dinner at the Oxford & Cambridge Club, Pall Mall. We were delighted by the interest shown in freemasonry by our visitors. The lodge was delighted to have the Headmaster and Mrs Brenda Green, accompanied by other members of the school staff, as their guests for a splendid dinner. Mr Green explained about the plans for the upcoming 450th anniversary of the school and his vision for the school over the next few years. Mrs Green informed the lodge about the continuing good works of the Bradby Club in the local community. Robert MacVicar (W 71-73) was pleased to present Mrs Green with a donation to assist the club on behalf of the lodge. The lodge was pleased to invite several guests from the Rugbeian Society to join us for dinner at the Oxford & Cambridge Club, Pall Mall. Both members and guests had a fine evening sharing great company; there were many reminiscences about former school days and also old friendships renewed. Many of our guests were curious about masonry and members were happy to answer their questions. In the case of five guests, they enjoyed the evening so much that they have now joined the lodge. One of whom lives in Hong Kong but travels to join us undeterred by the length of the journey. several members of the school staff, including Tracey Broadhurst PA to the Head Master and Tracey Ahmet Executive Assistant of the Old Rugbeian Society pictured above with the Worshipful Master Scott Adnitt, at what proved to be a most convivial event. In the evening we dined well and shared excellent company at the heart of the school in the charming surroundings of Old Big School. 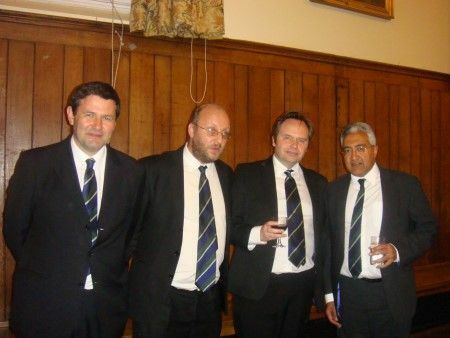 (from left to right) Tim Day Michell Housemaster and (T 83-88), Scott Adnitt (K 83-88), Oliver Handy (T 82-87) and Kamalesh Kantaria (M 82-86). The lodge visited Rugby and held a lunch and ceremony in the Arnold House, Rugby’s masonic hall, to bring Charles Ward, our newest member, into masonry. The day proved a memorable one for the candidate, the members and the various guests from the several local lodges represented. We enjoyed a reception and tour of the school before passing the former family home of the school’s founder, Lawrence Sheriff, and dining splendidly at the adjacent Brownsover Hall Hotel. The lodge had the pleasure of visiting the imposing premises of the Turf Club, kindly Mark Whitehead. After a welcoming reception, we proceeded to eat in a most impressive dining room with food and wine to match. The joie de vivre of the occasion helped to promote an excellent charitable collection at the end of the evening. To mark this memorable occasion the lodge held the installation at St. Bartholomew’s, which was kindly organised by lodge member Phil Blackburn (K). The stunning surroundings of Bart’s Great Hall provided a worthy location for the installation of Daniel Broby (C 78-82) as Master of the OR Lodge, followed by a magnificent festive board. Numbers attending were significant and guests included the Metropolitan Grand Master Russell Race and the Deputy Grand Master Jonathan Spence. Everyone agreed that it was a wonderful occasion, celebrated with gusto, and that the lodge would look forward to holding some future meetings at Barts’ Great Hall. Public Schools Lodges’ Council Festival, July 2010. A very enjoyable day was had by all who attended this year’s Public Schools Lodges’ Council Festival. The Council consists of 33 Public School Lodges which meet in London and each year one of the member lodges takes it in turn to host the Festival, normally at its alma mater. Rugby last held the event in 1990. Mindful of its tradition of providing a good party the Old Rugbeian Lodge rose to the occasion with some 280 Masons and their guests hosted by the current Worshipful Master David Thompson (Sh 80-84). Worshipful Master David Thompson (left), Headmaster Patrick Derham (centre), Deputy Grand Master Jonathan Spence (right). The Lodge was pleased to make a donation to the Arnold Foundation for £12,000. We were also blessed with good weather and the administrative skills of the Festival Secretary Robert Menzies Walker (Sh 79-84), a professional conference organiser. Yours is an excellent web site, well done. I would like to thank all of the members of the Old Rugbeian Lodge who helped to make our Installation night a memorable evening. Congratulations and fraternal greetings from sunny southern California. I have thoroughly enjoyed the first three months as WM of the lodge. It has been a pleasure to visit several lodges in England and two overseas, including four PSLC lodges to ‘fly our flag’. Within the PSLC I have had excellent evenings at the Old Salopian, Old Alleynian, Charterhouse DDD and Old Aldenhamian lodges. I have twice been accompanied by Oliver, our SD, and future visits that I am intending to make include the Old Haileyburian Lodge (Friday March 6th) and the Old Tonbridgian Lodge (Thursday March 12th), if any members would like to join me please let me know. It would be great to have your company. All of the members and visitors who attended our March meeting clearly enjoyed themselves. The ceremony, the dining, the locations and the company were all excellent. It was a pleasure to have Paul, the newest member of the lodge, in such fine form. Great evening this Monday, amusing guests as usual. Do you know who they all were? It was indeed excellent. Yes, we know who all the guests were.